Keeping count of how many times Spain's deficit targets and forecasts have been revised has become a challenging exercise. Following the publication of its draft budget for 2013, the Spanish government has admitted that Spanish deficit at the end of this year will be as high as 7.4% of GDP - with the EU-mandated target fixed at 6.3% of GDP - once the potential losses on the government's recent cash injections in the banking sector are taken into account. It can be expected that this kind of element of increase in the fiscal deficit related to bank capitalisation will be treated as a one-off and will not affect the structural deficit. We would not be too sure that this settles the question, though. First of all, the EDP covers more than just the structural deficit while other one off impacts (such as Portugal's transfers from its pension funds) have counted towards reducing the deficit. Secondly, it will be interesting to see how Germany, Finland and others will react - given that, in practice, Spain has just said that it will fail to meet its deficit target again. In the meantime, as we pointed out on this blog last week, the time for big decisions is approaching for Rajoy. The results of the stress tests have been published, and the draft budget for 2013 has been unveiled. In particular, both the European Commission and Spanish Economy Minister Luis de Guindos have stressed that the measures planned by Madrid for next year go "beyond" the recommendations Spain has been made under the new 'European Semester' - potentially paving the way for an EFSF/ECB bond-buying request without unexpected additional conditions attached to it. The Spanish were a bit hesitant but now they are ready to request aid. With the next meeting of eurozone finance ministers taking place on Monday, this weekend looked perfect for Madrid to apply for an EFSF/ECB bond-buying programme. 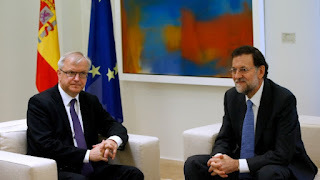 However, Rajoy reportedly told a meeting of regional Presidents from his party that he would not make the request this weekend. During a press conference less than an hour ago, he also replied with a curt 'No' to a journalist asking whether the request was "imminent." The domestic political reasons for a delay in the decision (key regional elections in Basque Country, Galicia and Catalonia over the next two months, plus the obsession with avoiding humiliación) are well-known. Apparently, Germany is also standing in the way. Sources have suggested that the German government is keen to "bundle" Spain, Cyprus and Greece into a single dossier, rather than submitting individual aid requests to the Bundestag for approval. If I am not mistaken, the EFSF is now defunct. The bailout request would have to come from the ESM. As you know, ESM loans are senior for those countries entering a program after the ESM is in force, per Article 13 of the preamble. 1. A bit of a non-issue imho. It hardly matters how things are booked. Markets (is the experience with the private sector) will look at the total picture and that doesnot change. The rules are basically there for the markets. In the way that when deficits and debts are kept low, markets donot make problems and one country cannot pull the rest in the mud. Here it hardly matters, how it is booked. Spain is uptil its nose in the mud and will stay there however it is booked. 2. Bundling the 3 countries has the advantage that Merkel only have to face parliament one time. But the question has come up if Cyprus is systemic (and earlier pre-condition, now looked to be dropped as rescue the South have become a cause by itself) and it isnot unless everything is systemic. And Greece for which all agreeing with a new package and stating that Greece will repay the remainder of its debts will look completely uncredible. With as alternative a huge public sector cut and budget consequences. Very questionable if the opposition want to go along with it. Likely the SPD wants a proper statement on the issue. Bundling means one not accepted whole package back.